The ToughPad GPS docking station was created for the excellent, Waikato-based GPS tech company Smartrak. Smartrak had attained a contract with Fonterra, requiring they fit-out Fonterras fleet of milk tankers with powerful Panasonic touch screen tablets. During the R&D process, Panasonic seconded two engineers from its HQ in Japan to Gloster, in Newton place, to ensure a presence in the valuable network. The toughpads are now present in all Fonterra tankers, performing as per design and reducing Fonterras fleet operating costs. 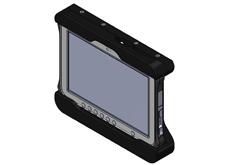 ToughPad docking station created for Smartrak, at www.smartrak.co.nz contact Gloster Engineering today with your machining requirements.